Cyberwar, Cyberterror and Cybercrime have been buzzwords for several years now. Given the correct context, using cyber has merits. However Cyber-Headlines are full with Cyber-Reports about Cyber-Incidents, Cyber-Hacking and Cyber-Cyber in general. However, that whole discussion does not only suffer from sensationalism of journalists and bloggers, there are also some fundamental problems, says Stefan Schumacher. We are still lacking useful definitions for modern IT security threats and we still have to think about the assessment of capabilities in the IT field.Besides institutional actors like states and their military and intelligence community we also have to assess the capabilities of non-institutional actors like terrorist groups or organised crime. Unlike the assessment of classic military strength (eg. fighting power or Kriegsstärkenachweise), assessing the capabilities and powers of actors in the IT field is much more complicated and complex.In his talk Stefan will introduce the first tools, methods and statistics to compare hacking capabilites and assess the »cyber fighting power« of different actors. He will look into the capabilities of state actors and their agencies as well as the capabilities of their economies and how well they can be translated into IT security. Additionally, Stefan Schumacher will try to assess the capabilities of independent groups like organised cyber crime, terrorists and hacking groups. Their capabilities are much harder to assess, so he will look also into their history, culture and ethics to find answers. Finally, Stefan will introduce some tools from IO psychology that can be used to assess the technical capabilities of organisations and the motives and motivations of their members. Ever since he liked to explore technical and social systems, with a focus on security and how to exploit them. He was a NetBSD developer for some years and involved in several other Open Source projects and events. He studied Educational Science and Psychology, has done a lot of unique research about the Psychology of Security with a focus on Social Engineering, User Training and Didactics of Security/Cryptography. Currently he’s leading the research project Psychology of Security,focusing on fundamental qualitative and quantitative research about the perception and construction of security. 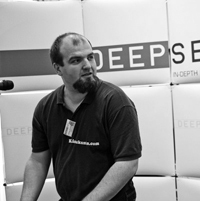 He presents the results of his research regularly at international conferences like AusCert Australia, Chaos Communication Congress, Chaos Communciation Camp, DeepSec Vienna, DeepIntel Salzburg, Positive Hack Days Moscow or LinuxDays Luxembourg and in security related journals and books. This entry was posted on November 3, 2016 at 12:45. You can follow any responses to this entry through the RSS 2.0 feed. Both comments and pings are currently closed.